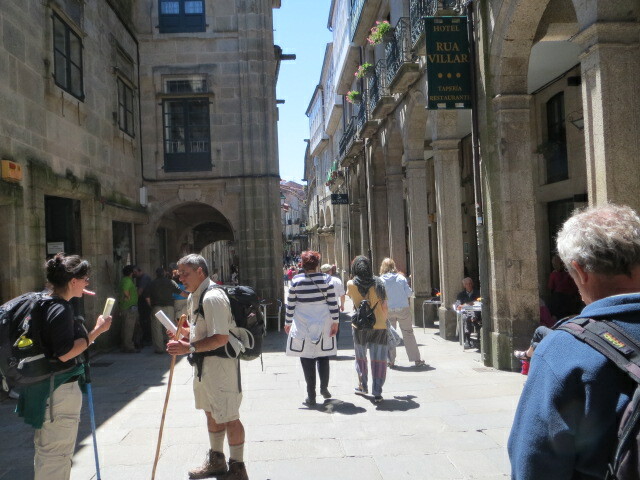 The following morning there were more tourists who came up to us and said that they had heard about us and wanted to congratulate us for completing the Camino and wanted to hear more about it. It was somewhat embarrassing to us, but we did the best we could. Roger and Nancy came in to eat, as did Sister Carol. We went back to the room and discussed whether or not we should get the bus to Finesterre. Ultimately, we thought this might be too much of a rush at the last minute, and if there was a delay of some sort, it might cause us to miss our plane to Madrid. We got our bags packed and ready to go and checked them with the desk so that was off our minds. The clerk said that she would call us a cab to the airport whenever we wanted and that it would be 18 Euros and would take half an hour to get there. That gave us some peace of mind knowing that it was taken care of. Then we left and went back to the Cathedral area for some additional shopping. 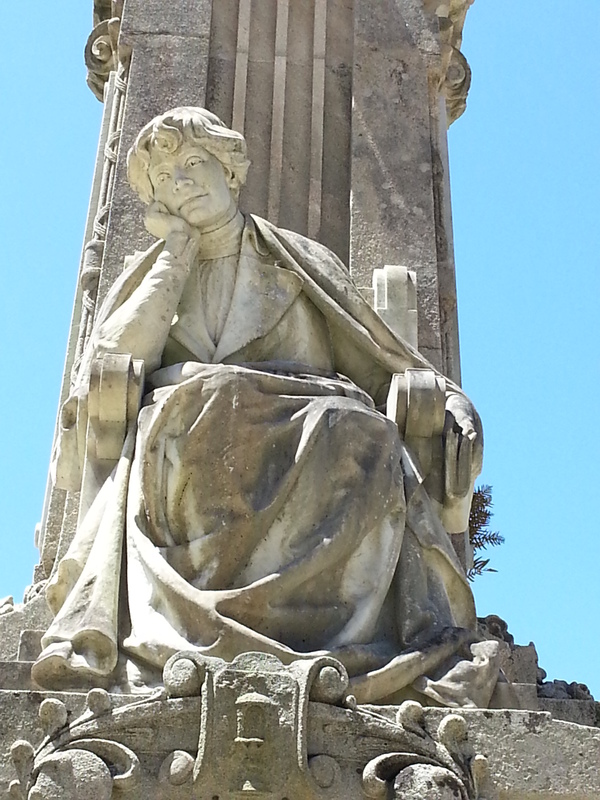 It was a beautiful day once again, so we decided to walk up to Santa Susanna in the Alameda Parque at the west of town. 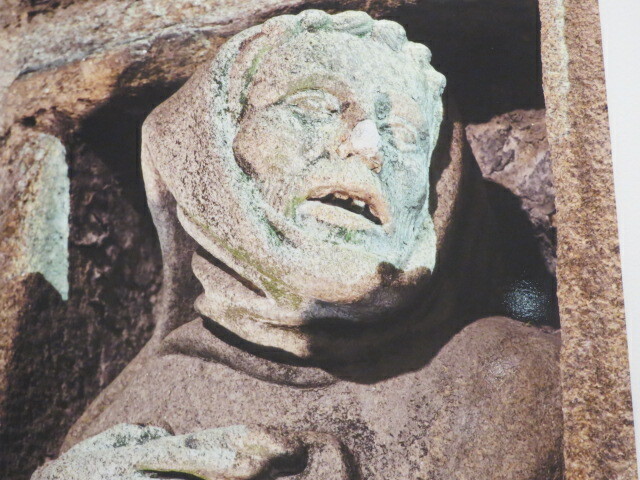 There was an old Romanesque church there and a statue of Rosalia,de Castro, a famous poet. This was a beautiful Sunday morning and the park and the streets were full of families really enjoying the day. Back near the Cathedral we sat for awhile between the police headquarters and the Parador Hotel and just looked at the Cathedral and its splendor. In the square, there were still many pilgrims re-uniting for who knew how long and we rejoiced along with them at their joy in completing the trip as well as seeing old and new friends once again. We ate some nuts while sitting there in the warm sunshine, and then went back towards Rua Vilar and snapped some additional pictures. Our friend with the sitar was set up and playing once again. Our plane did not leave until 5:40 so we still had a considerable amount of time before we need to be back to the hotel to catch the cab. 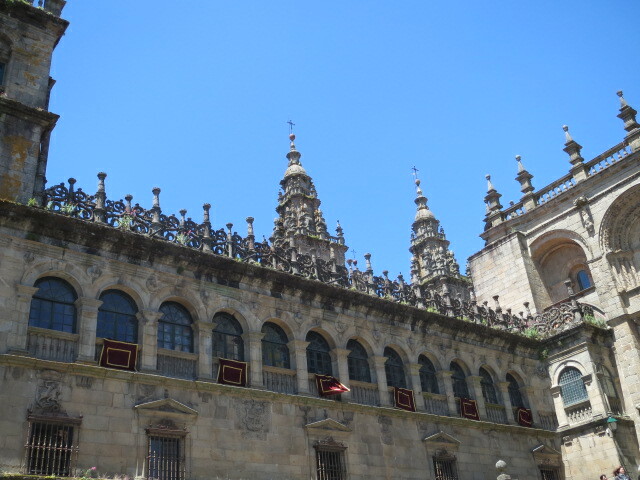 We found the Cathedral museum near the spot where we received our Compostelas and went inside to check that out. We were told that it would close within the hour, and so we made a rushed tour of the three-story building. 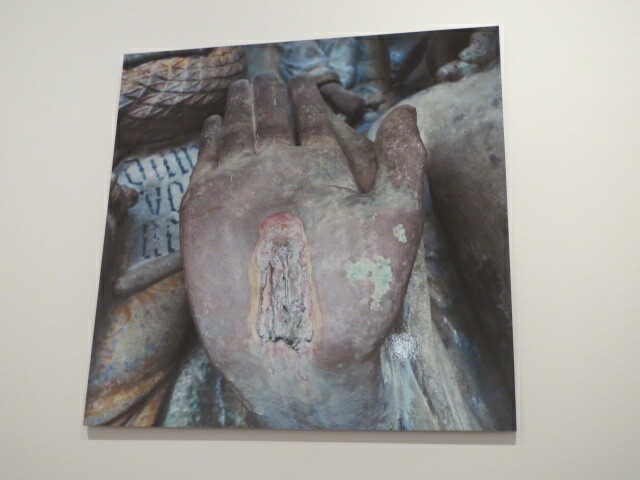 There were some interesting artifacts and sculpture inside that we wished we could have had more time viewing. After a while we found a restaurant and ate our last meal. Appropriately, I decided on a Spanish omelet and a beer. When we stepped outside we were surprised to see the blister expert from Sahagun (from Seattle), and Linda from Denmark (whom we had met in Molinaseca). We hugged each other, happy that we had all made it. 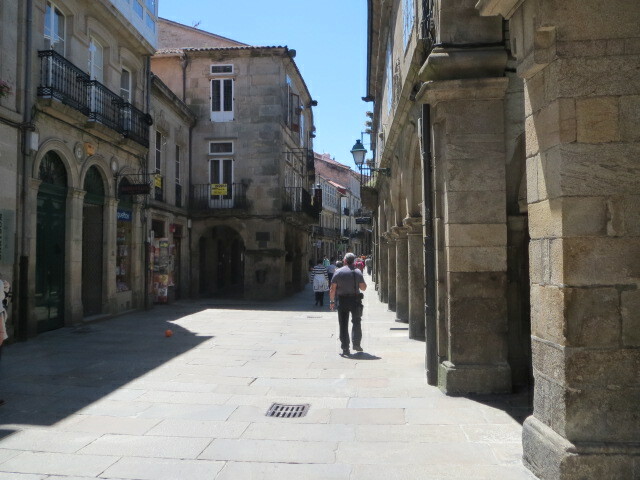 A block or so away, we ran into Richard who told us he was getting ready to leave on the Camino Portugal. His wife would join him from Australia, and they would walk a considerable portion together. After wandering the streets for another hour or so, we stopped at an ATM to get some cash, and then headed back to the hotel to wait there. In the bar at the hotel, we ran into Roger and Nancy once again and it was good to see them before we left. We exchanged email addresses and business cards. 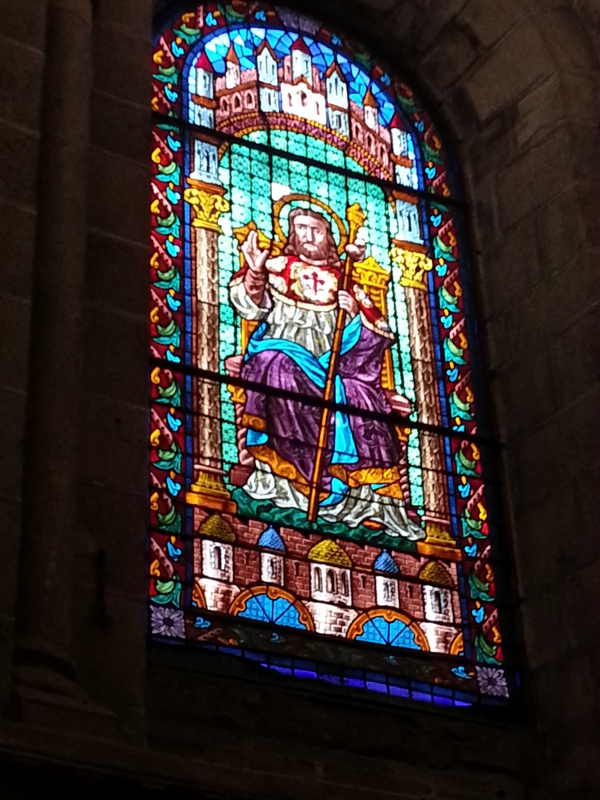 Nancy asked us to share our spiritual experiences of the trip. I told her I just wasn’t ready to do that since it had not all sunk in yet. We said goodbye and walked upstairs to the lobby to get the cab and go to the airport. The ride to the airport was indeed only 20 minutes, and the driver dropped us off in the departure area. When we went inside to check our bags, we found out that we had missed our plane. The flight had been moved up to 3:00 and there were no more planes to Madrid that day! The Iberian Airlines representative told us we could get an early flight to Madrid in the morning that would still easily connect us with our flight to Dallas from there. 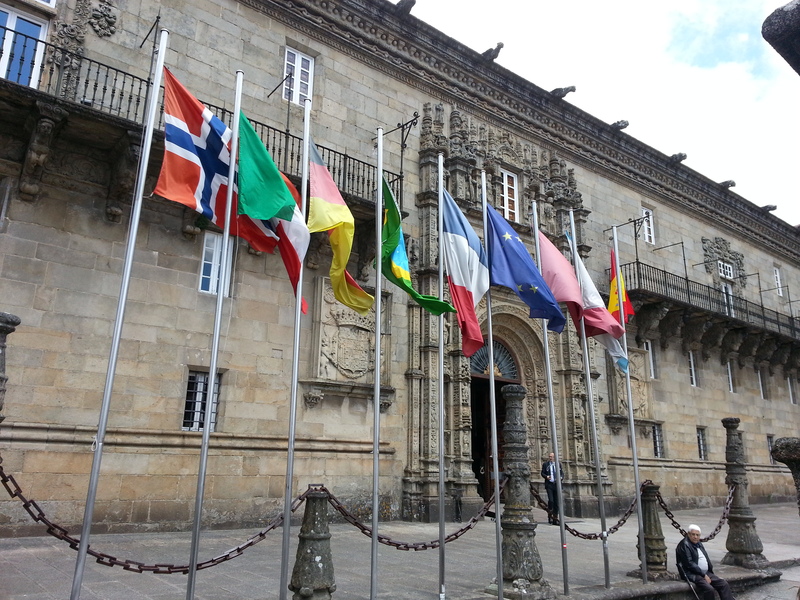 So, it was not a disaster, but we would have to spend another night in Santiago. It was too late to cancel our room at the Madrid hotel for the evening, so we would just have to eat that. The airline rep recommended two hotels near the airport that were not very expensive, so we got a cab and went to the Hotel Garcas, only a five minute ride from the airport. I asked the cab to wait while I checked to see if there was a room available. There was, and we paid the cab and checked in. Garcas was not unlike many of the places we had stayed at. The WiFi only worked in the lobby/bar area so we posted our delay, which wasn’t really a delay I suppose, just more of a change. We sat at the bar and had a few drinks. Dinner was not until 8:30, so Greg and I just ate some nuts and ice cream from the vending machine and went up to bed since we had to be up early. We got out on time in the morning and caught a bus to the airport after waiting out on the main road for about a half hour. The flight to Madrid lasted about as long as it would take to fly to LA from Sacramento, and we arrived with plenty of time to change planes and get to Dallas on schedule. In Dallas, they kept changing the gates on us, and we had to even change terminals once, but we had time to get a cheeseburger and fries in a restaurant there and call Heather and Marianne. Finally we boarded the plane and landed in Sacramento right on time. The welcoming committee consisted of Heather, Marianne and Greg’s son Stephen. They had made a big sign on top of a painting I had done last year of a kilometer marker on the Camino. I hugged Heather until I think she could no longer breathe. It was so good to be back home in the arms of love. Hello Don: Thanks so much for the wonderful and inspirational story! 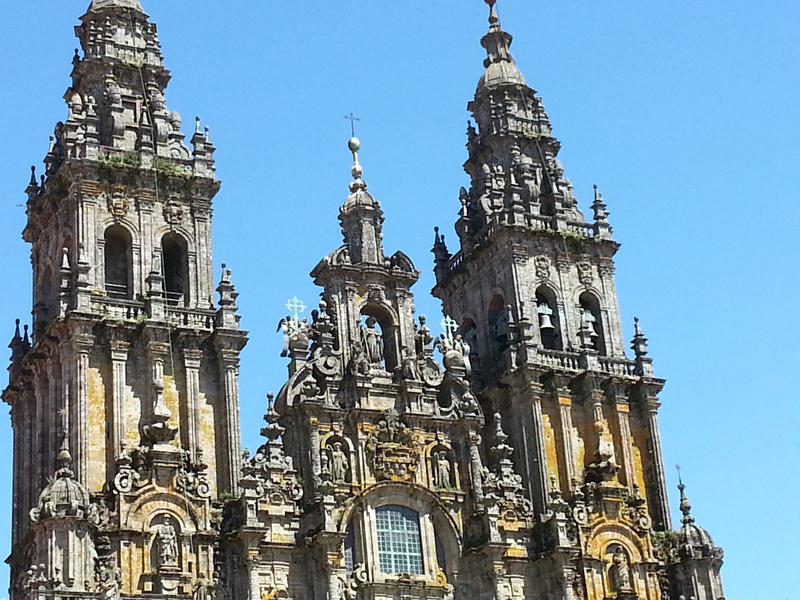 God willing, I will be 81 in summer 2015 and am now seriously considering walking the Camino. If you see this, would you mind sharing with me the name of the company which you used to organize your trip, move your luggage each day, etc?? I would appreciate it if you would contact me off-line by email: hymccown@swbell.net.